To understand this document, you have to at least know basic HTML and HTTP POST/GET request. Payment are streamlined and consist of 4 steps. Login, Transfer Information, Confirm Transaction, and Result. Merchant can provide SUCCESS URL (a link) and SUCCESS METHOD (POST/GET) that will be used as action link for SUCCESS FORM. This Form will be shown as a “Back to Merchant” Button on the Last Step (Result) of the Transaction. Merchant can provide FAIL URL (a link) and FAIL METHOD (POST/GET) that will be used as action link for FAIL FORM. This Form will be shown as a “Back to Merchant” after the user pressed the CANCEL button. Merchant can provide link to an image file that will be used as Banner or Logo on the SCI. The maximum dimension is 600x100 pixels. Immediate Payment Notification is a notification (callback) system that will send STATUS FORM to STATUS URL on successfull transaction. Secure Field are baggage field that was send using the SECURE MODE inside fp_sec_field and will only be returned to Merchant in STATUS FORM. Those make it hidden from user and prevent it from being tampered. fp_amnt Amount of transaction which should be transferred. The value here will be converted into float number with two decimals. FsC = Fee On Sender Choice (Default), Buyer is free to choose the type of Fee. Not available in Secure Mode. fp_currency Currency used for transaction. fp_comments Comment/Note for this transaction. fp_merchant_ref MERCHANT REFERENCE field. it can be used to hold identification number from the shopping cart or other use. fp_success_url URL which used as SUCCESS FORM action and submitted by “Return to Merchant” button. 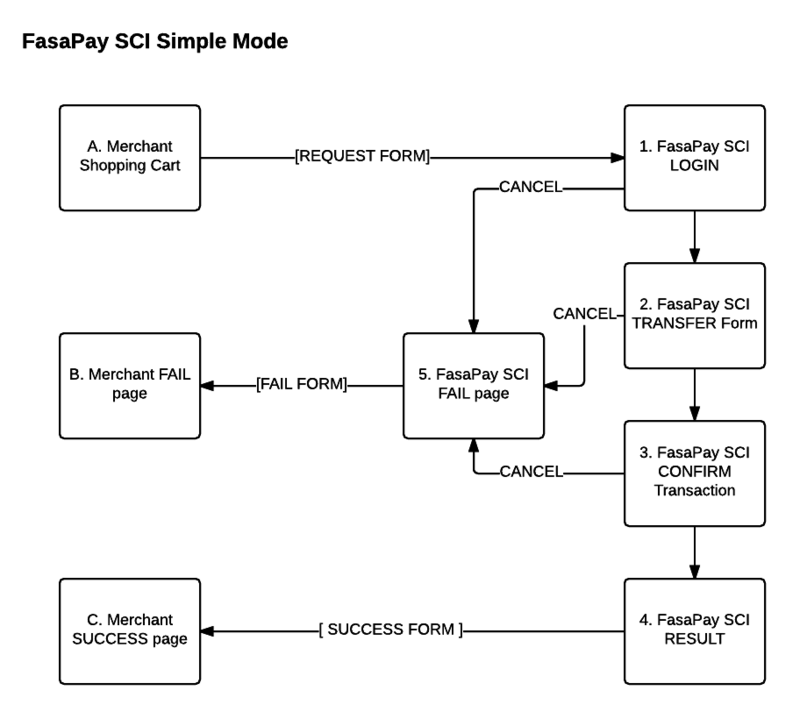 Shown in Step 5 (FasaPay SCI RESULT Page) when transaction is completed successfully. if using Advance Mode or Secure Mode it will be overridden or automatically filled by store success_url from the merchant store setting. fp_success_method Method used by SUCCESS FORM at the FasaPay SCI RESULT page. If using Advance Mode, it will be overridden or automatically filled by store merchant setting. fp_fail_url URL which used as FAIL FORM action and submitted by “Return to Merchant” button. If using Advance Mode or Secure Mode, it will be overridden or automatically filled by store fail_url from merchant store setting. fp_fail_method Method used by FAIL FORMat the (5) FasaPay SCI FAIL page. fp_status_url URL which used as STATUS_FORM action. (IPN Callback). If using Advance Mode or Secure Mode, it will be overridden or automatically filled by store merchant setting. 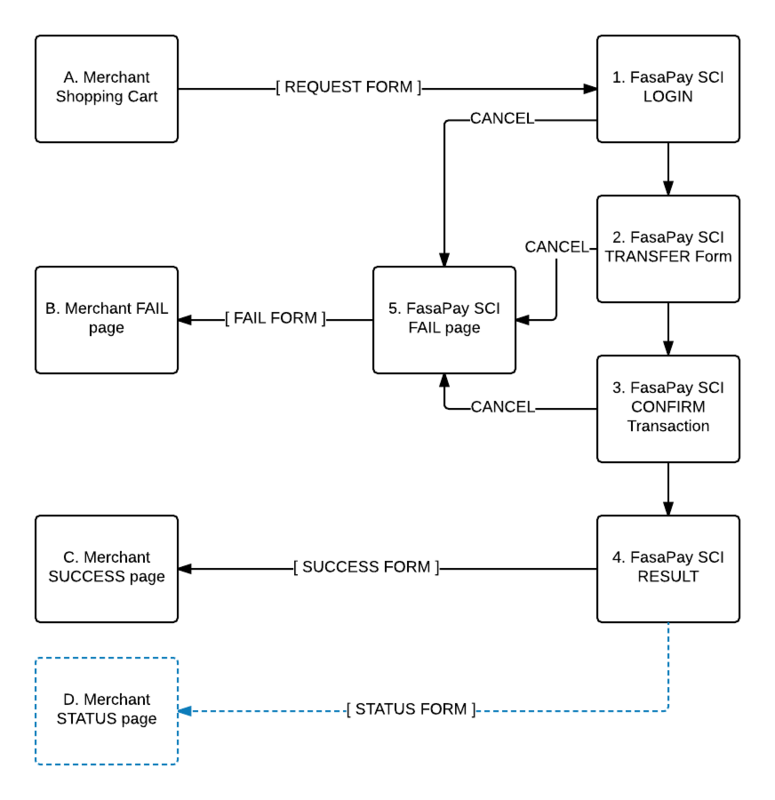 fp_status_method Method used by STATUS FORM to send the Transaction Data. fp_sci_link If present FasaPay will return SECURE MODE JSON data. Merchant can use this field to hold sensitive data that should not be seen by user. Please only use this field to initiate Secure Mode. additional field Additional field or baggage field. SECURITY CONSIDERATION, in Simple Mode and Advance Mode The REQUEST FORM and (2) FasaPay SCI TRANSFER form are rendered on user’s browser therefore opening the possibility of data tampering and sometimes used to create fraudulent transaction, please always check the integrity of STATUS FORM and/or check the transaction using FasaPay API Detail Operation or manually check it on your FasaPay Transaction History. FAIL FORM is a form that exists in the FAIL page it shown as Back to Merchant button, it purposes is to send user back to merchant website. FAIL FORM is optional and only exists if fp_fail_url is defined. in the fp_fail_url page merchant can create a page with alternative payment method or to continue/retry the payment. SECURITY CONSIDERATION, while this form is intended to be used as failed transaction notification, the data are submitted by user’s browser therefore opening the possibility of data TAMPERING and can be used to send misinformation. fp_amnt The amount that should have been transferred. fp_currency The currency that should have been used in the transaction. fp_store The Store name that should have been used in the transaction. 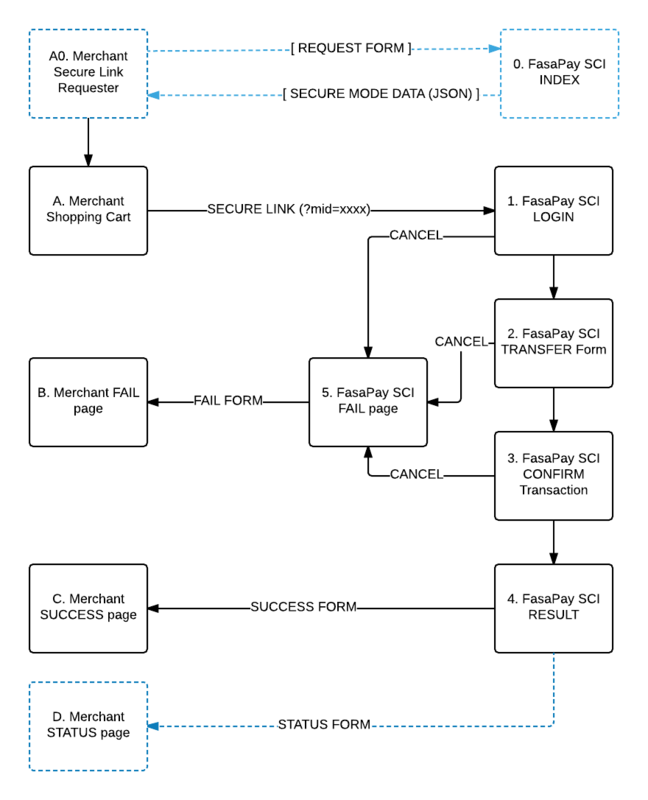 SUCCESS FORM is a form that exists in the (4) FasaPay SCI RESULT page it shown as Return to Merchant button, it purposes is to send user back to merchant website. SUCCESS FORM is optional and created when a transaction is completed successfully and fp_success_url are defined. In the fp_success_url page merchant can create a page with successful payment notification or post payment transaction*. SECURITY CONSIDERATION, while this form is intended to be used as successful transaction notification, the data are submitted by user’s browser therefore opening the possibility of data TAMPERING and can be used to send misinformation or FRAUDULENT data. Please AVOID using this form to validate a complete transaction. If you need to automated process or validate transaction, please use the fp_status_url and STATUS FORM. 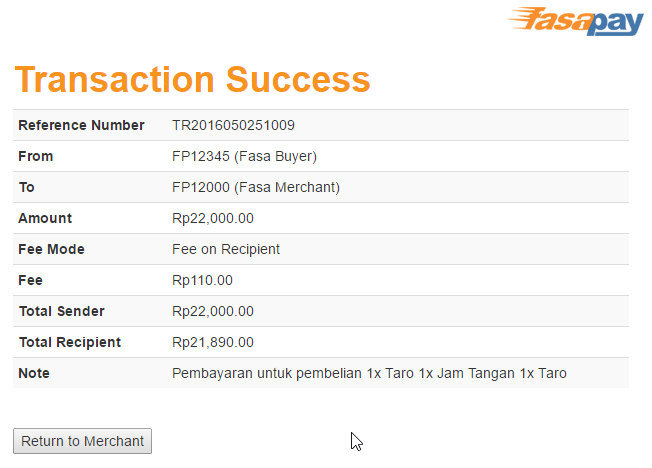 fp_paidby User’s (Buyer/Payer) FasaPay Account used to transfer fund to Merchant’s FasaPay Account. fp_total The total Amount that fp_paidto or Merchant receive. fp_timestamp Date time when the transaction occurred. STATUS FORM is form that contain the transaction detail and some security information. STATUS FORM purpose is to notify Merchant of successful transaction. STATUS FORM will only be created if fp_store is defined and exists in the Merchant FasaPay Account Store Setting, and fp_status_url is defined either in REQUET FORM or in Store Setting. STATUS FORM contains HASH value (fp_hash, fp_hash_2, fp_hash_all) that you should validate to ensure the validity and integrity of STATUS FORM data. SECURITY CONSIDERATION, STATUS FORM will only be send from FasaPay Server. To add more layer to security of your application if possible please only use FasaPay STORE setting to define fp_status_url and leave fp_status_url and fp_status_method blank (or dont include them at all) in the REQUEST FORM. It is also advised that you use IP whitelist and only accept the data send from FasaPay Server’s IP. fp_hash FasaPay SCI v.1 sha256 hash based data verification. Because it is only verifying few most basic data, please use it with care or consider using the most complete form. fp_hash_2 FasaPay SCI v.2 sha256 hash based data verification. fp_hash_all FasaPay SCI v.3 sha256 hash based data verification. fp_hmac Prefixes data with a keyed SHA-256 hash value using the HMAC method so that it can be detected if it is tampered. This is an alterative way to validate the data posted in the STATUS FORM. This is for documentation purpose only. please use fp_hash_2 or fp_hash_all or fp_hmac for more detailed data validation. SHA-256 HASH is used to generate the value of fp_hash. SHA-256 HASH is used to generate the value of fp_hash_2. SHA-256 HASH is used to generate the value of fp_hash_all. prefixed data with keyed SHA-256 hash value using HMAC method. Secure Mode is used if you need added security in your data and limiting user from most of the option in the transaction process. The data returned here is used to redirect user and to reconfirm your request data. Use point (.) as decimal separator. Please remove Thousand Separator.